I was digging through Evernote earlier this week and stumbled across a file titled: Killer DF12 Sessions for Sales. I vaguely remember creating it after Dreamforce 2012 and decided to take a look at a few of the videos I'd clipped. I’m so glad I did! Out of the dozens of sales cloud sessions now on youtube, I want to share 3 quick clips that deliver three major ideas. Mark Roberge, HubSpot’s VP of Sales, shares a bit about how he develops leaders and reps in his 250 person sales org. To set up the clip, Mark is talking about his team of 20 (mostly 1st-time Managers). He lays out the case that one thing newly promoted Sales Managers tend to get wrong is trying to coach too many things at once. The big takeaway for me is that rep development doesn’t happen by serendipity. Many sales organizations have a coaching 'strategy' in place, but as the saying goes, culture eats strategy for breakfast. If you want to know, really know, if you have a coaching and development culture, take a look at the calendars for your Front-line Managers. I have a hard expectation on my team that you are going to get better, every month. And I want all my Managers to not be pushing paper and pushing forecast, I want them to maximize the time that they coach. Brent Adamson, Managing Director of CEB, presents some of their research as laid out in The Challenger Sale (warning: check your volume Brent gets loud). To set up the clip, Brent is laying out the case that selling isn’t about teaching customers something new & valuable if and when that doesn’t lead to them buying from you. The big takeway for me is that the key to change (and isn’t that what a sale really is?) 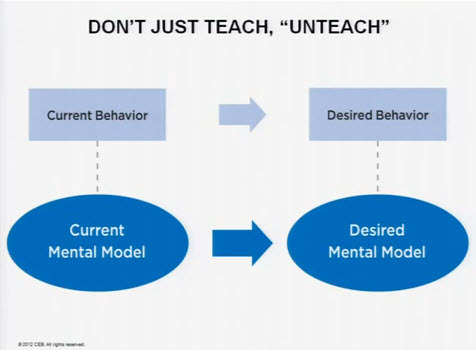 isn’t changing behavior – it’s changing thinking. Far too often as sellers we do the dance, find great pain/gain fit, and then… nothing. More often than not this is because our prospects readily admit they have a solvable problem, but the pain of change hurts worse than the gain from making it go away. I was in the room for this one and was totally blown away by salesforce.com’s Chief Scientist JP Rangaswami. Count me a JP fanboy. In this clip, JP is laying out the case for what engagement means and how aspirations and feedback loops impact performance. Sales is perfect for this. Feedback loops like leaderboards, wall of shame, stack rankings, etc. are built into our culture. The key will be complimenting those feedback loops with aspiration, mastery, and peer social feedback. 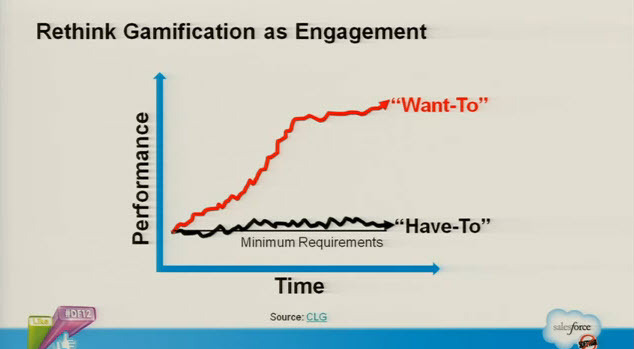 The importance of understanding why gamification has a role to play in the Enterprise is because it is perfectly reasonable to assert that we could get higher levels of performance by learning from people who know how to create engagement and applying those lessons in a context that doesn’t know how to do that. What do you think? Any other points that hit home with you?